My very “bah humbug!” husband who always says that holidays aren’t his thing and he doesn’t like to celebrate anything said to me in the car one day as we were out running errands, which included a trip to the grocery store, “…why don’t we pick up some stuff at the grocery store to make Christmas cookies…” I think I might have been rendered speechless by his casual statement. In reality, what he really said to me was that we should each come up with an idea for Christmas cookies and then go home and make them. He proudly told me that he actually had an idea in mind already that would only require a couple of ingredients. When we arrived at the grocery store I was still so dumbfounded that I actually couldn’t think of anything I wanted to make so I told him that we would just make his cookies and then I’d come up with something later. 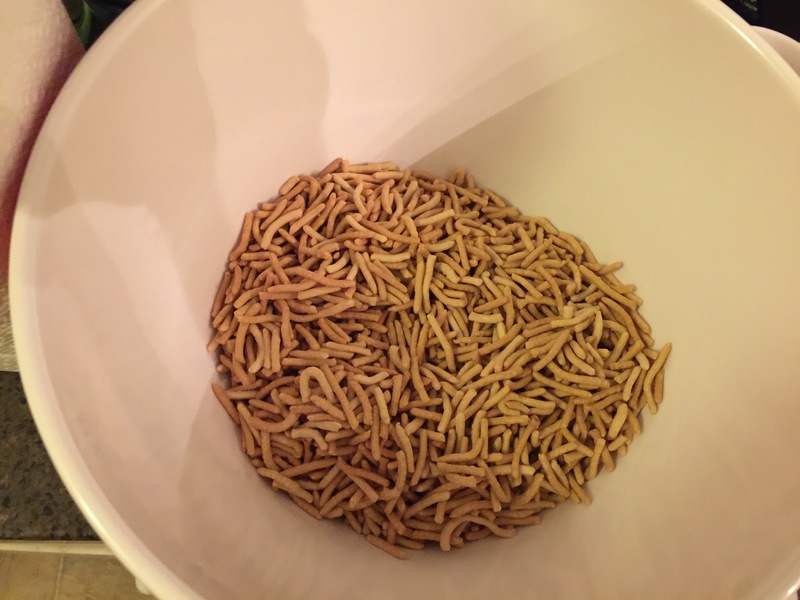 It’s rare that my husband ever has any of these ideas when it comes to making something new in the kitchen because his motto usually is to spend as little time in the kitchen cooking as possible. 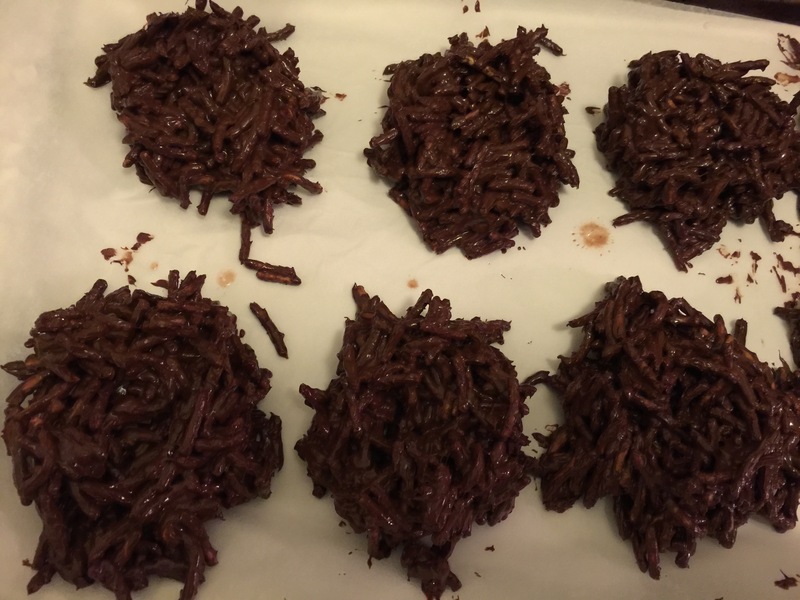 My husband started off by telling me that these were no-bake (his favorite kind!) Christmas cookies that he used to make as a kid with his mom. 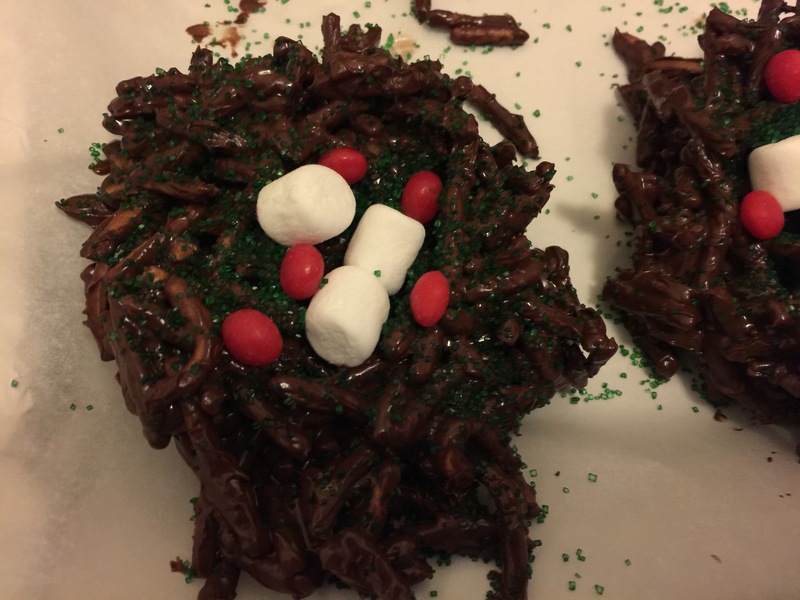 In actuality, you can’t even call it a “cookie” as its not at all, so after we made our treats we decided to call them chocolate Christmas tree nests. To make the very simple version, all you need is two ingredients, chocolate and chow mein noodles. 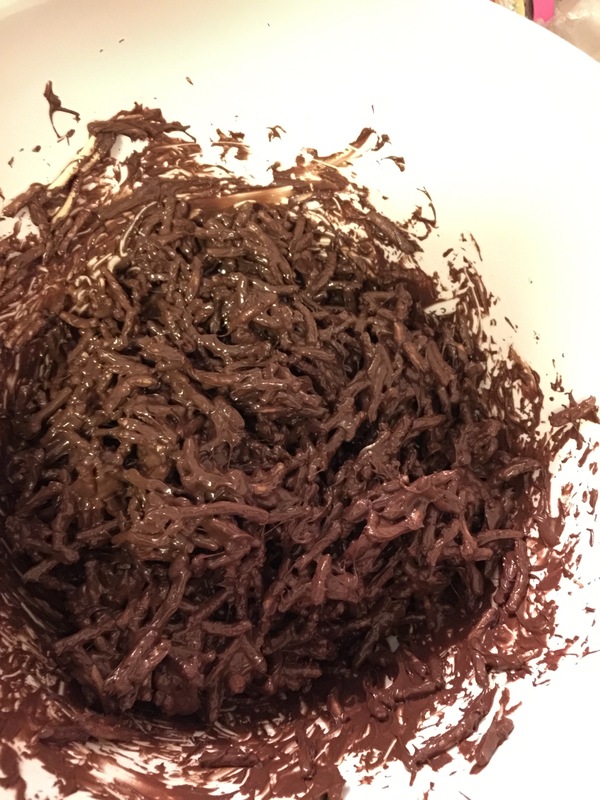 At least that’s what my husband told me and I found it very strange as I’d never heard any sort of combination of ingredients where you put chow mein noodles together with chocolate. I wasn’t quite sure where this was going, but I was willing to humor my husband. To make this treat a bit more “Christmas-y” we decided to trump it up with a little bit of red, white and green in the form of green sugar, red cinnamon candies and white marshmallows. 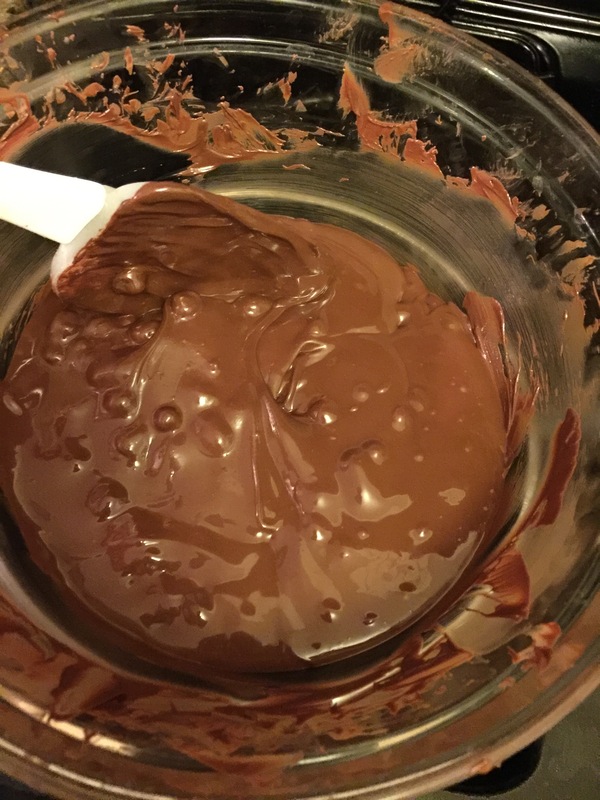 You start off by setting up a double boiler to melt your chocolate. Take a bag of good quality melting chocolate and dump it into a glass boiler set over a pot with a few inches of simmering water. The steam from the simmering water will heat the bottom of the glass bowl just sitting inside the pan creating double boiler. Use a silicone spatula and continue stirring around the chocolate chips in the bowl. Within a few minutes the chocolate chips will start to melt. As you stir the chocolate chips around they’ll start to lose their shape and melt easily into a beautiful, glossy chocolate sauce. 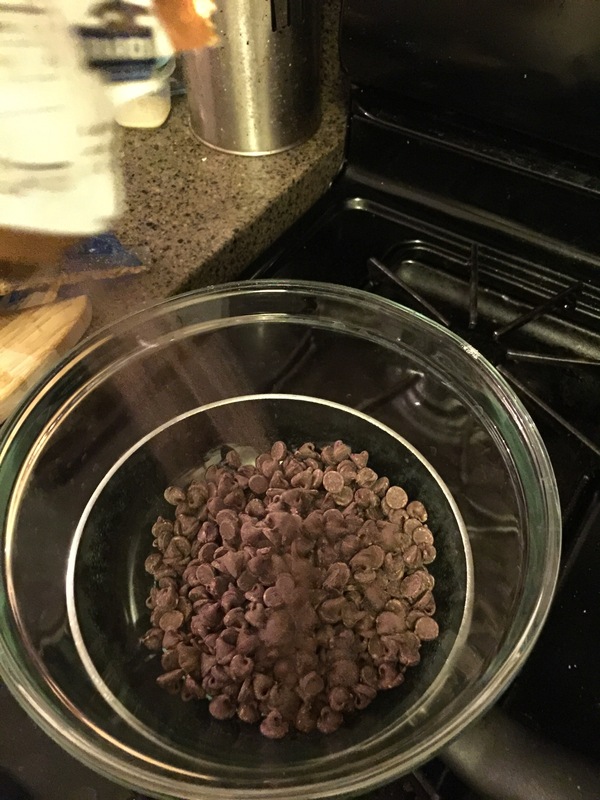 Continue stirring until all of the chocolate chips have melted and make sure to scrape the bottom of the glass bowl to ensure that none of the chocolate is scorching. In a separate bowl, pour in a whole bag of chow mein noodles. Now the fun part! 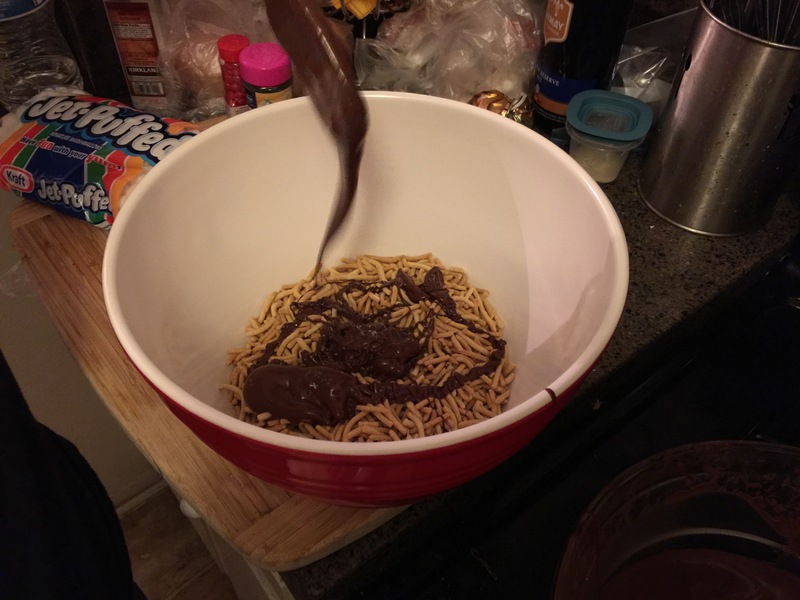 Pour the chocolate sauce you’ve just created directly into the bowl with the chow mein noodles and start stirring. It’s easiest to use your hands and mix it all together, but a wooden spoon also works. Be forewarned, this can get a bit messy! But you want to combine them together until the chocolate fully coats all of the chow mein noodles. On a parchment lined baking sheet, scoop out handfuls of the chocolate covered chow mein noodles. Form sort of a “ball” shape and flatten it out onto the baking sheet. Use your thumb to put an indentation in the middle of the ball shape to form a sort of “nest.” This is the chocolate nest. 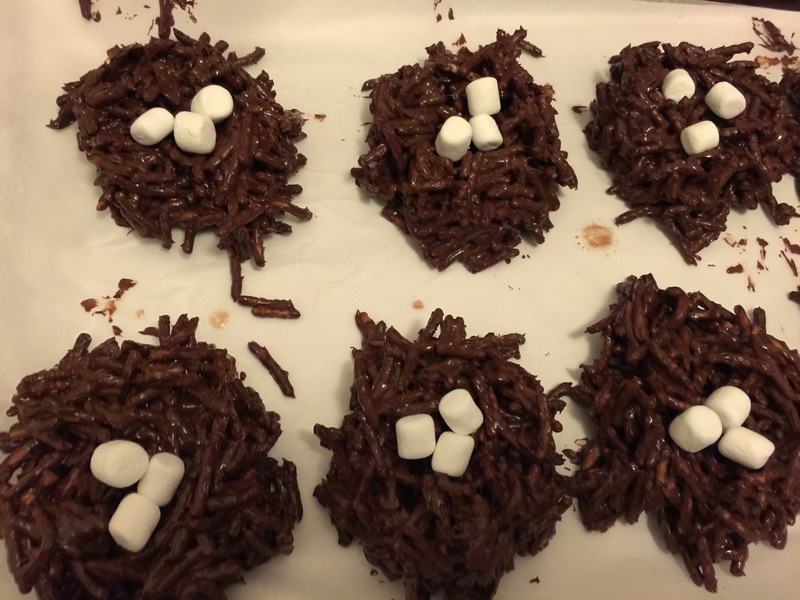 Once you have formed your nests, it’s time to add decorations to make it “Christmas-y.” We started by adding a few mini marshmallows into each nest. We didn’t want to crowd the nest, but wanted to add some pops of color that would remind one of Christmas. Next came the red. It’s not Christmas without red and green, right? The red came in the form of a couple of pieces of red cinnamon candies dropped into every nest. Intersperse the red cinnamon candies with the white marshmallows. And finally the green came in the form of green sugar. 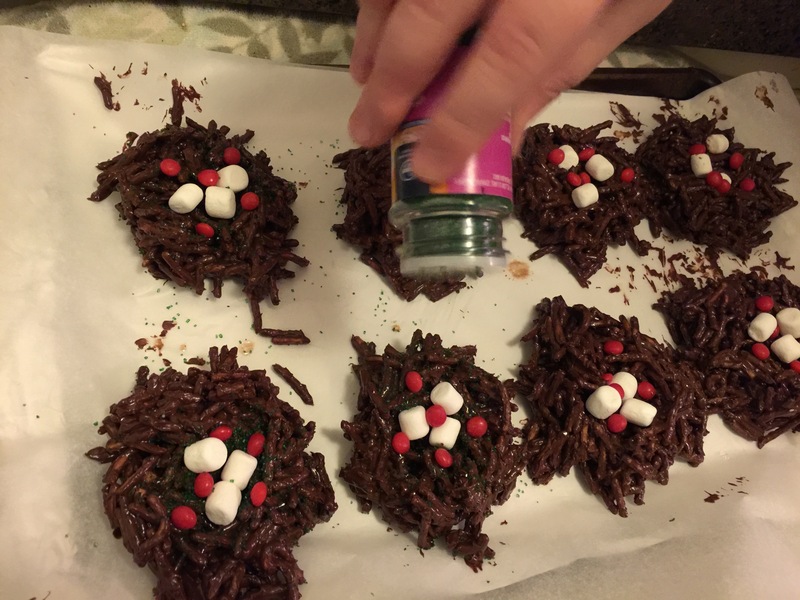 A little sprinkling of green sugar over all of the nests for a little pop of added Christmas colors. 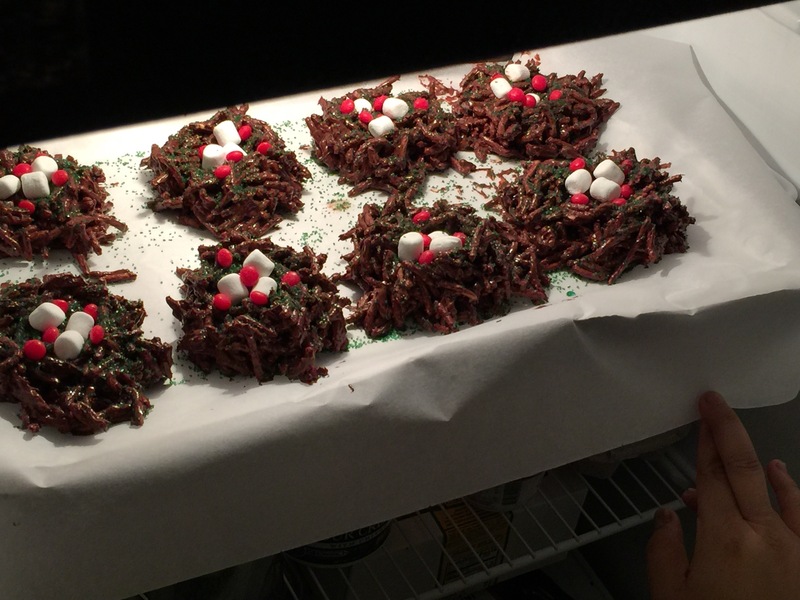 When the nests are fully decorated, pop the baking sheet into the refrigerator for an hour or so to set the chocolate so that the chocolate Christmas tree nests retain their “nest” shape and all of the decorations stay “stuck” on the nests. After an hour, they’re good to go. You can store them in an air tight container and enjoy them as you wish. 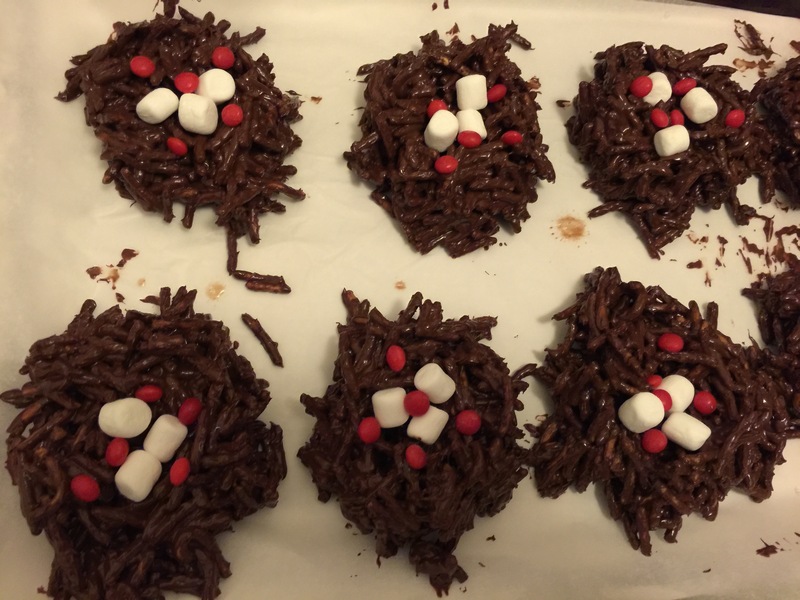 The chocolate Christmas tree nests are colorful, fun to make and really tasty. Never once had it crossed my mind to combine melted chocolate and chow mien noodles, but surprisingly, because the chocolate is sweet and the chow mien noodles aren’t, they make the perfect combination. 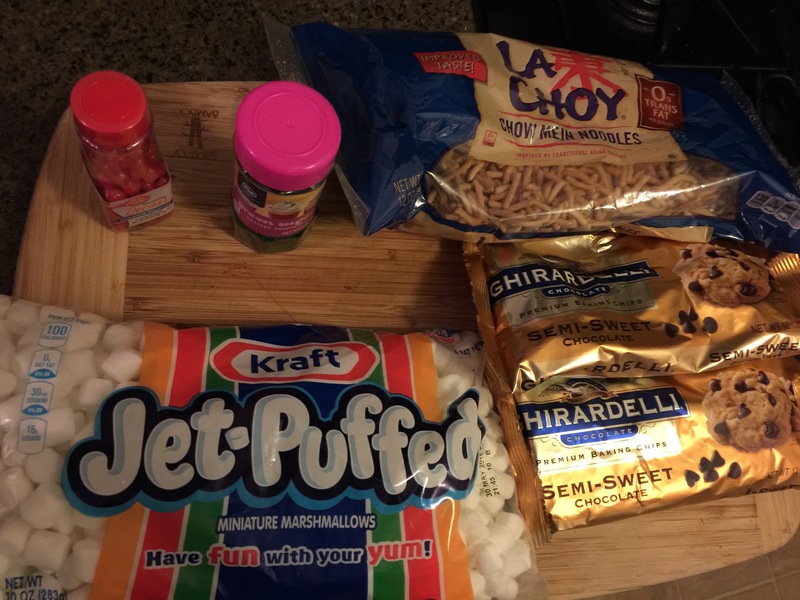 The dessert treat is crunchy and sweet and has that chocolate hit for your sweet tooth, and best of all, the treat literally takes 15 minutes to make, plus an hour in the refrigerator, and there’s absolutely no baking involved at all. After all, the holidays are hectic enough, trying to find the time to bake homemade cookies and treats is few and far between, so this is the perfect type of treat to whip up for friends and family or for a Christmas cookie exchange or even for yourself.